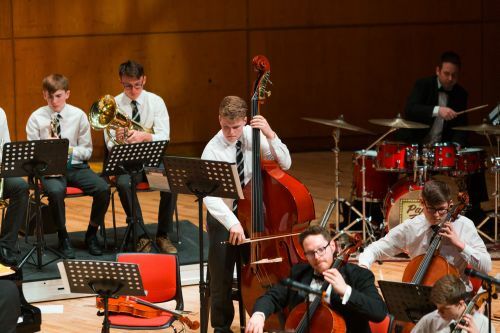 On Thursday May 3rd, the students and staff of CCRs Music department took to the grand stage of The University Concert Hall, Limerick once again for the annual music concert- Musica Vivit. This year, the music department staff, led by Mr William Cullagh brought a record number of students to the stage; almost 100 in total! For the first time, patrons were treated to a number of new choirs including a 2nd year choir, TY choir and even a choir from Junior House (accompanied by a newly formed guitar ensemble.). As well as some timeless orchestral works by Handel, Grieg, Bizet and others, soloists performed a variety of repertoire ranging from jazz standards to chart hits and everything in between. This year, preparations began early in the academic year, both on and off the stage and the evenings programme and huge list of performers was a true embodiment of the school’s motto: “Where the strong May have something to strive for and the weak may not be discouraged”. We were also delighted to show off the talents of our special guests, Dromakeenan National School and the Musical Theatre Academy, Nenagh who performed a number of Irish traditional pieces and excerpts from modern musicals respectively. The talent in North Tipperary really is something to behold and we were so honoured to have both schools accept our invitation to perform. They truly made the night even more special. We look forward to an even bigger and better evening of entertainment for 2019 and thank everyone for their continued support in putting on such a momentous and important night every year.